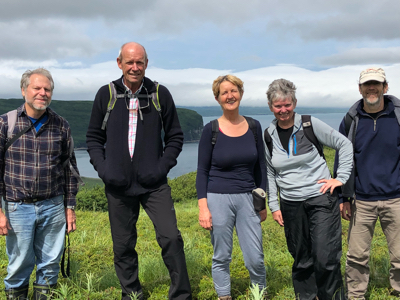 We bypassed Dora harbor and motored another 60 miles to a remote anchorage named Captains Harbor, near the base of Mt Dutton on the Alaska peninsula. A very protected anchorage in a basin of jagged granite, steep mountain sides with brush. We’re finally starting to see more brush, still no tall trees though. There was a bear in the shoreline but only Jacomine got to see it. Salmon were jumping but we aren’t fishing yet. It’s heavily raining and so we’re off to another anchorage called Volcano bay, 30 miles around the corner. 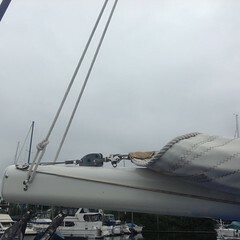 We will be harbor hopping for about 10 days on our way to Kodiak. At least we’re done with overnight passages for a bit. It’s tiring to motor all day but there are so many beautiful places to see here. And lots of whales too! 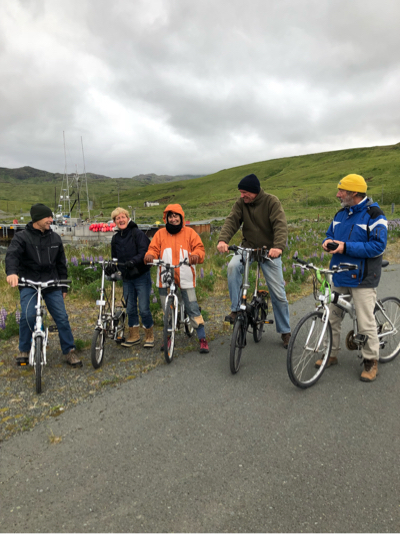 7 days in Dutch Harbor, Unalaska. A large fishing port that boasts of home port to “The Deadliest Catch” fishing boats. We saw film crews and captains walking around town, they looked a little fishy and scruffy to me. We spent every day with cruising friends and boat projects for everybody. This was the first port with an extraordinary expensive Safeway grocery store, Ace Hardware, a real gas station. Bald eagles sit on the dumpsters like begging seagulls on the beach. They’re dirty and scruffy looking, their feathers litter the road and harbor area, they are a menace to the wind index at the top of the masts and poop all over the boats. But we still stopped to watch them soar overhead. The juveniles fight in midair screeching as they lock their talons and do the classic tumble. 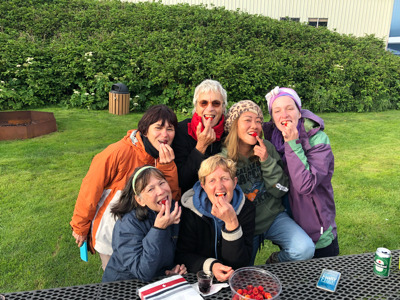 We said tearful goodbyes as we split up to cruise our separate ways, wished Jacomine a happy 60th, barbecued fresh halibut – a gift from a local fisherman, and ate nearly a gallon of huge sweet salmon berries. The weather finally lightened up so we are now headed for Dora Harbor, a small knob on the east side of Unimak island, 138 miles from DH. The wind is calm but the island chain creates fast currents causing large swells with tide changes. Whales swim by very close- diving and slapping their massive tails. Bright yellow and orange headed puffins swim in clusters, and large gray boobies skim the surface of the beautiful sapphire colored water. This is an amazing leg of our journey! We are doing well, getting lots of sleep and finally able to cook and eat. John was the mainstay of this leg as I battled motion sickness. 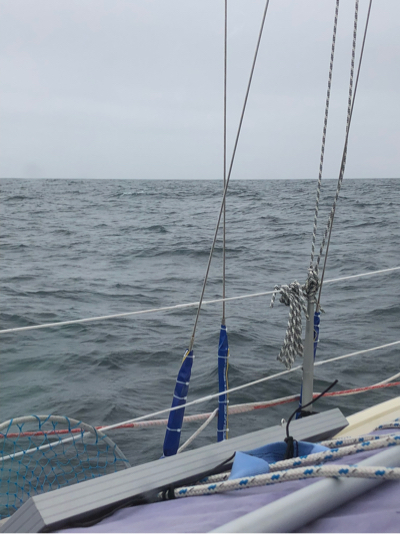 The cold sea is fairly calm at the moment, a nice relief from the rolling and pitching while cooking or standing to chart our position. With very little wind the sea suddenly becomes turbulent, chasing us with white cappped 2-3?meter waves on long swells about 7 seconds apart lasting several hours. Peering out through the cabin hatch I can see only walls of dark gray water looming closely at the stern. A few caught us by surprise sending clear water through the lifelines. The cockpit is a salty mess each time we step out to look around. John does most of the work outside as it’s very slippery and he has a hard time maintaining his foothold. I am easily thrown about so I stay just inside the companionway waiting for instructions. The Bering sea, another adventurous dream fulfilled. Far off, 709 miles to the North we are just abeam “The Big Diomede island”. It’s Russian territory sitting almost equally between Alaska an Russia. 20 miles to the Alaskan border and 23 miles to the Russian border. Pretty cool. We thought we’d see some Russian fishing fleet on radar or the AIS but we encountered only one Alaskan fishing boat thus far. Miles of gray ocean and light gray sky beyond our visual scope in all directions seem so surreal at times. Like we are the only two people left on the planet. No radio chatter, not even static noises. We are motor sailing and approaching the northwest corner of Umnak Island. We have only to round Umnak and Dautch Harbor, Unalaska will be within 15 hours. We hope to arrive by early morning to catch a slack current. The opposing current runs at about 2.5 knots against us later in the day. At least the forecast is for North wind and very light so our headway into the dock area shouldn’t be hampered. A new place, new surroundings, reuniting with our cruising buddies. We will post again as we turn the corner! Pos 52 48N. 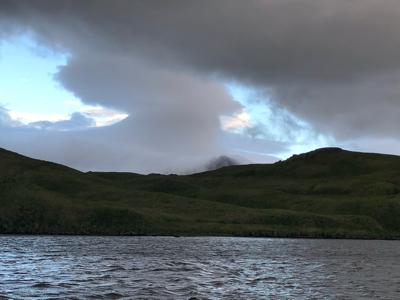 172 30We departed Adak harbor at 06:15 in good conditions with full sails. We anticipated stronger wind once out from the protection of the island so we’re prepared for a brisk 400 mile sail to Unalaska. 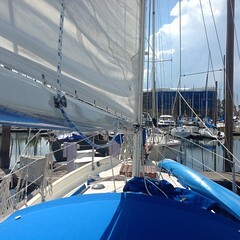 Our noon to noon run was 133 nm in 20 knots with steep waves in short periods. 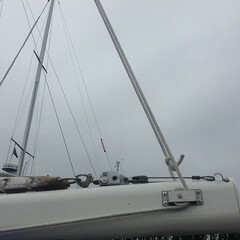 As the wind increased we dipped our cap rails into the water, forcing us to slow down and reef our the sails. We surged down some of waves with a skidding effect that sent my stomach lunging upwards. Bring on the seasick tablets. The wind has abated some leaving us with northwest sloppy seas from the Bering sea and light wind from the Southwest. 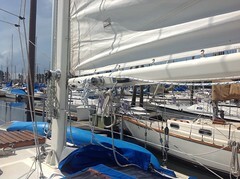 Bad combination for sailing downwind or even quartering off the beam. 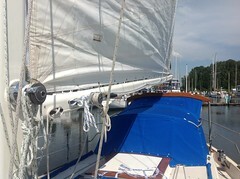 So we’re motorsailing til the wind picks up and the sea conditions stabilize. We have 230 miles to go. We bought Adak sweatshirts with the words “Adak, Alaska Birth place of the Winds” they aren’t kidding. The picture was taken when we arrived in Adak. The south wind was gusting over 50 knots around Mt. Moffet, elevation only 2800 feet but the affect of the williwaws were very apparent. Notice the boomerang shaped cloud. 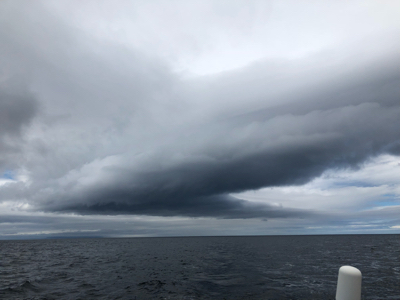 We sailed under that with reefed sails and heeled so far over we that we had to keep our hands on the sheets/ropes to release the wind from the sails to right Konami. The clearing in the center of the boomerang was windless leaving us bobbing on the choppy sea. It was a kickass ride! Wind has picked up, I can hear the waves rushing under us now. Time to pay attention to the them, surfing and skidding isn’t good for our appetites. 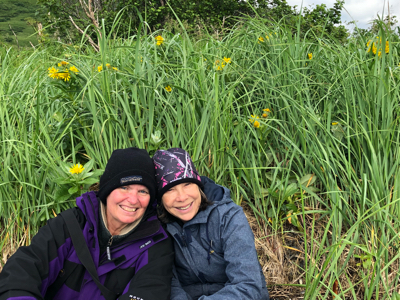 We departed Bay of Islands this morning after spending 1 great day in beautiful tundra and mountains with lake, caribou, bald eagles flying overhead; and 2 nights sitting out 27 kts of wind in the small cove with 2 other boats. 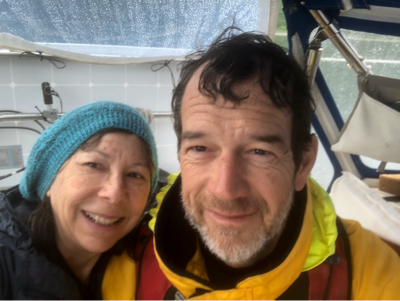 Gusting winds howled down off the mountains as we all sat in our doorways watching to make sure we weren’t dragging anchor. Trapper’s cove is a small sunken crater with just enough room for 3 boats snuggly anchored in close proximity to one another. All was very good, we enjoyed a traditional Japanese “hot pot” dinner aboard Konami, the first since leaving Japan for all. A very nice celebration to have us 3 boats back together once again. 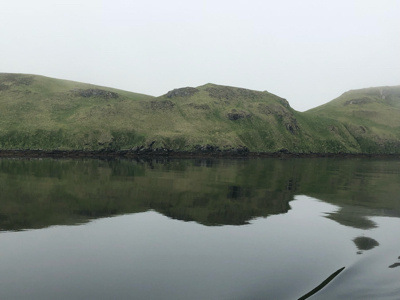 We are bound for Sweepers Cove, 38 miles around other side of Adak. There is a 4th July celebration at the boat harbor, burgers and maybe fries- john’s favorite. We heard that there will be fireworks too but being it’s still daylight at midnight not sure what we will see. ?We’re not sure how long we’ll be in port, there is another big blow coming by The end of the week. Watch for us on the Iridium Go tracker. It’s a Northern Paradise sitting in the cockpit at anchorage in the Bay of Islands, A few laps of incoming tide water, the rush of water coming down the small streams on shore, birds chirping as the large bald eagle sits out on a rock watching for swimming prey and an occasional salmon jumping nearby is all that we can hear. The fog is lifting off the mountain tops and the sun is peeking through the thin layer warming the exterior of the boat. It’s so serene and the solitude is so welcomed. We love the daylight at midnight! We are making the most of our private paradise for a few days as the weather shifts.